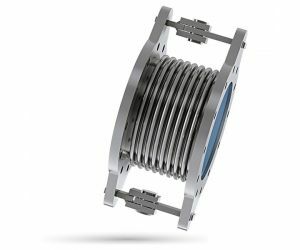 The hinged expansion joint is made up of a single bellows and some metal articulations with their corresponding pivots, which allow angular rotation along a single plane. The plates on the articulations and the pivots must be designed to support the force of the pressure, as well as any other specified load. In cases where axial motion must be absorbed, the holes for the bolts can be channeled, although the resulting design will not resist the force of the pressure. The hinged metal expansion joint is very good at absorbing angular movements. 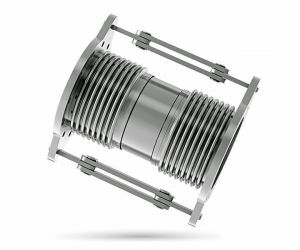 Unlike unrestrained axial and universal expansion joints, hinged expansion joints do not absorb large axial loads created by internal pressurisation to the adjacent pipe supports since it is absorbed by the tie rod / bar / hinge arrangement.